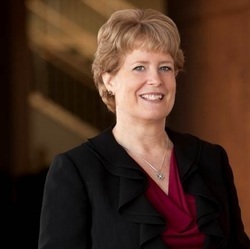 Jan Kraybill is Principal Organist at Community of Christ (formerly RLDS) International Headquarters in Independence, Missouri and Conservator of the Julia Irene Kauffman Casavant at the Kauffman Center for the Performing Artsin Kansas City, Missouri. She performs regularly on the famous 113-rank Aeolian-Skinner (1959) Auditorium Organ and the Temple's magnificent 103-rank Casavant organ (1993), and oversees a staff of about thirty volunteer organists who, for fifty-two consecutive summers, have presented daily recitals on these instruments. She plans and provides music for worship services, coordinates a concert series, designs and conducts international hymn festivals, teaches workshops, and serves as a resource person for church musicians and worship planners. Her degrees are Bachelor of Music Education and Master of Music (piano performance) from Kansas State University in Manhattan, KS, USA; and Doctor of Musical Arts (organ performance) from the University of Missouri-Kansas City Conservatory of Music in Kansas City, MO, USA. In 2010 she achieved the highest level of certification awarded by the American Guild of Organists, the Fellowship (FAGO) certification. Dr. Kraybill performs as both a pianist and organist throughout the United States and abroad. She has performed in many venues in the United States as well as Canada, Germany, Poland, Russia, South Korea, and Tahiti, and has undertaken multiple tours of the United Kingdom, including performances at Chester Cathedral, Exeter Cathedral, and London's St. Paul's Cathedral. She has appeared on regional and national musicians' conventions, including the American Guild of Organists (AGO), the American Choral Directors' Association, the Hymn Society in the United States and Canada, and the Association of Lutheran Church Musicians, has been heard frequently on Kansas Public Radio, and has been featured on Minnesota Public Radio's program Pipedreams. She has performed as harpsichordist and organist with the acclaimed Baroque group the Bach Aria Soloists, the Kansas City Symphony and the Grammy-winning Kansas City Chorale. Her solo CDs are Two by 2: Two Organ Symphonies on Two Magnificent Organs, recorded at Community of Christ's Auditorium and Temple organs; Rejoice and Remember, a collection of hymn-based piano music for all seasons of the liturgical year; and The Auditorium Organ: Fifty Years of Excellence, celebrating the 50th anniversary of the installation of Community of Christ Auditorium's Aeolian-Skinner in November 2009. Dr. Kraybill has served in volunteer leadership in many elected offices in the American Guild of Organists, and is currently Regional Councillor for AGO Region VI, representing ten states on the National Council. She also serves on the Executive Committee of The Hymn Society. In addition to her musical activities, Jan enjoys painting, lace-making, antiquing, and riding her Harley-Davidson with her husband, Allan.